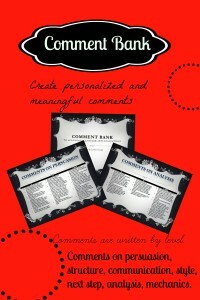 With report cards right around corner and an increasing demand for specific student comments, make your life easier with this Comment Bank. 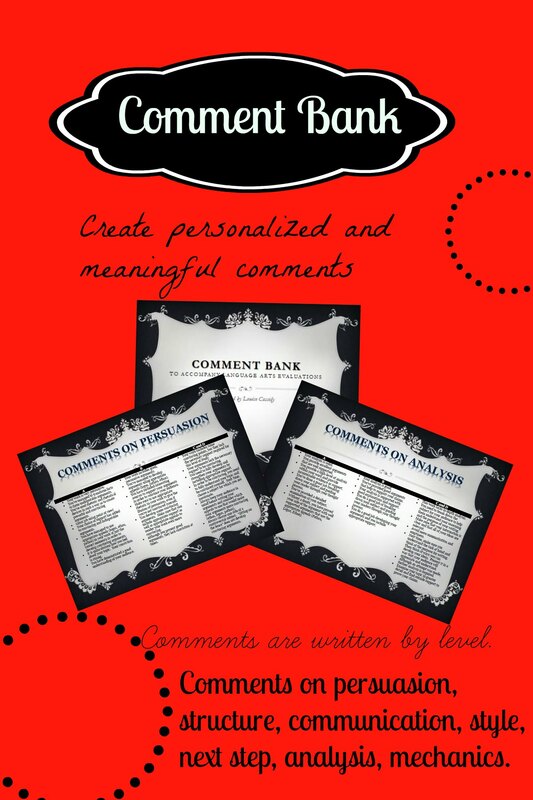 The Comment Bank has been constructed to save the Language Arts teacher time when offering constructive and helpful comments on students’ evaluation. Marking papers in any Language Arts class is always a lengthy process. Increasingly, teachers are being asked to write more detailed comments to highlight students’ strengths and weaknesses, and sometimes we run out of ideas. Being the vigilant teachers we are, and wanting to help our students achieve their potential is and will always be one of our priorities. To this end, when marking students’ papers, writing down everything we want to say to them about their papers would be a very lengthy process. I have decided to share my personal comment bank with you. The package contains 7 pages of comments, which are divided by levels of accomplishment A, B, C and D.
Included in this package are over 120 comments for students. You can get inspiration from these pages to handwrite your comments, or you can do what I do and copy/paste your comments into a word document, print, and staple the comment to the students’ evaluations. This is a real time saver. Parents, students, and school administration LOVE this method of feedback. And, this way, it takes much less time to be much more efficient.